A case of blossom end rot. This resource from NC State University outlines the strategies to prevent or reduce blossom-end rot, a disorder caused by a lack of calcium in the developing fruit, resulting in decay on the bottom of the fruit. Salinity is a major problem affecting crop production all over the world: 20% of cultivated land in the world, and 33% of irrigated land, are salt-affected and degraded. This process can be accentuated by climate change, excessive use of groundwater (mainly if close to the sea), increasing use of low-quality water in irrigation, and massive introduction of irrigation associated with intensive farming. 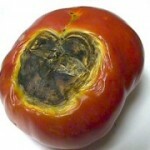 Tomatoes are susceptible to a variety of non-pathogenic fruit disorders. This article addresses some of the more common disorders, identifying the symptoms and causes with photos. Management recommendations are suitable for organic production. As part of Cornell University’s Vegetable MD Online, this Web site includes photos to help growers identify the disorder afflicting their tomatoes. Information on each disorder includes why it occurs and how to prevent it. This publication from Iowa State Cooperative Extension places emphasis on prevention, while also addressing diagnosis of symptoms and separating physiological disorders from insect and disease damage. The Vegetable Growers Information Portal was developed to bring together all the resources pertaining to production, management and marketing of tomatoes that a grower will need to be successful. 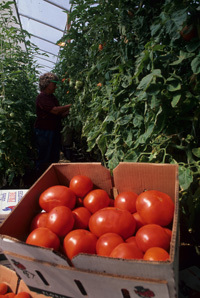 Extension agents and growers can find research-based information specific to North Carolina vegetable production on this site, whether the information originated in the Department of Horticultural Science, Agricultural and Resource Economics, Plant Pathology, Entomology, Biological and Agricultural Engineering or the State Climate Office. Success in agriculture requires a multidisciplinary approach. The goal in designing information portals is to save growers and Extension agents time and effort by creating a one-stop shop for a specific agricultural commodity. In addition to faculty contributions, this site will include feature articles about growers and industry representatives sharing their own experiences. New growers will find resources specific to start-up, while new and experienced growers will recognize the convenience of the weather/climate links. When a question about tomatoes comes to mind there’s no need to go globetrotting across the Internet; one stop at the Vegetable Growers Information Portal will provide the answer.